The new Farish Class 24 is a prime candidate for replacement drop-in 2mm wheels. 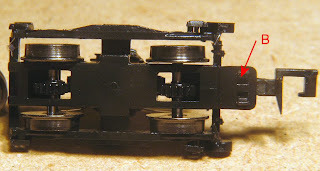 This shows how to get into the Farish bogie and remove the N gauge coupler with a minimum of fuss. The bogies is detached from the chassis by gently levering (twisting) it from the frame, as if the wheels on one side are much lower than the other. It will click out from the underframe. Alternatively, one can dismantle the entire chassis block, but that's a lot more work. Comparison of Drop In 2mm wheelset (left) and standard Bachmann-Farish N gauge wheels on right. The 2mm wheels have not been blackened at this stage, it is as they are delivered. Most people will want to either blacken or paint the front faces. The 2mm wheels are insulated. The axle is anodised aluminium which is non-conductive, and thus does not conduct with the wheel "glued" onto the axle. The gear is also fixed with retaining compound. Remove the sides of the bogie by pressing down at point A whilst holding the bogie wheels on a flat surface. The frames will click downwards and can be pulled away. Note the the gear tower is handed; there is a difference in the small tabs at the front and back, so don't rotate it relative to the cosmetic frames. Once inside, just gently lever out the Farish wheels one set at a time. Check whether the pickup strips need easing out a bit wider for the 2mm wheelset, then click the wheelset into place. 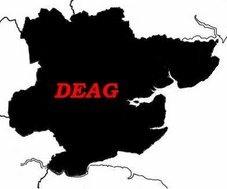 Repeat with other axle. Removing the N gauge "Arnold Brick" coupler. View from below bogie. Press gently on tab "B" and the coupler will come away from the bogie framing. Brilliant idea! Well done to all involved. 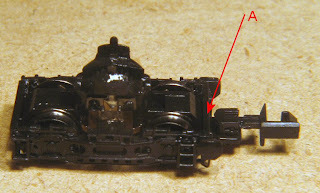 Are the Farish gears in the class 24 made of plastic or metal? If plastic, what will be the effect of using the brass gear as fitted to the replacement wheels?